Based on Shakespeare's The Comedy of Errors, A HOT DAY IN EPHESUS is about two sets of twins; twin masters both named Antipholus and twin servants both named Dromio - separated by shipwreck, all eventually end up in Ephesus where multiple instances of mistaken identity lead to love, laughter, farce, and joyful, joyful song! Click here for Tickets! We have a wonderful cast, all ready to sing and dance their heart out for you! - Stefin Collins as The Duke, Bryan Quinn and Jonathan Trinh as the two Dromios, Elmer Strasser and Jai Sahai as the two Antipholi, Alexandra Holtzman as Adriana, Jamie Harkin as Luciana, Don Hardwick as Aegeon, Carina Salazar as The Courtesan, Jennie Brick as the Abbess and Meira Perelstein as The Goldsmith, along with Jody Christian, Garret Wilson, Asali Nichols and Peggy De Coursey. Musical Direction by Evan Alparone, Choreography by Laura Wesslund. Sets by Steve Coleman with assistance from Lilli Smith. A Full band led by Don Clark. Costumes by Helen Slomowitz. Light design by Chelsea Camp, and dramaturgy by Carolyn Day. A HOT DAY IN EPHESUS draws on a rich vein of musical theatre history. 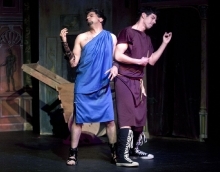 TE COMEDY OF ERRORS itself is based upon a play by the Roman comic playwright Plautus, whose plays were in turn the source for Sondheim's and his collaborators as they developed A FUNNY THING HAPPENED ON THE WAY TO THE FORUM. Richard Rodgers and Lorenz Hart's 1930’s hit BOYS FROM SYRACUSE was also based upon Comedy of Errors, though of course with a musical palate from a much earlier era. Audiences will find A HOT DAY IN EPHESUS an ingenious concoction, complete with a Motown number, a sassy tango and a rap. A HOT DAY IN EPHESUS, by AE Member Vicki Siegel, began its production career in 2009 as hit in workshop form for the Curtain Theatre in Mill Valley and is now coming to the East Bay for its World Premiere! We hope you'll come and see this musical farce in April 2012 and enjoy this upbeat new take on a classic comedy. (cash or check only at the door). Bryan Quinn . . . . . . . . . . . . . . . . . Dromio S.
Elmer Strasser . . . . . . . . . .. . . . . . Antipholus E.
Jai Sahai . . . . . . . . . . . . . . . . . . Antipholus S.
Jonathan Trinh . . . . . . . . . . . . . . . Dromio E.